Daimler is open to the idea of creating an alliance between Germany's premium carmakers to manufacture next-generation batteries. "There are commonalities between the German carmakers." Daimler CEO Dieter Zetsche said when asked whether Mercedes-Benz would consider extending an alliance formed earlier this year to buy Nokia's maps business, Here, to battery technology. 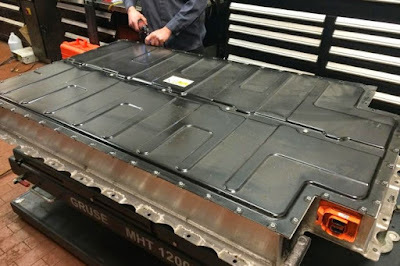 "Nokia Here led to a common approach... and there might be other areas," he told a news conference at the Frankfurt auto show, adding that any such cooperation would most likely start with the next generation of batteries. Daimler, Volkswagen's Audi and BMW teamed up to buy Nokia Here last month for around 2.5 billion euros ($2.8 billion) in the most significant cooperation to date between the rival premium carmakers. Daimler are currently exiting the battery cell manufacturing business by closing subsidiary Li-Tec later this year while planning to spend 100 million euros (US$125 million) in coming years to increase production of lithium-ion battery packs in eastern Germany using cells provided by South Korean based LG Chem. Mercedes, BMW and Audi/Volkswagen all rely on Korean battery manufactures, LG Chem, Samsung SDI and SK Innovation, who between them hold 41% of global automotive battery patents for current generation battery cells. Samsung SDI Battery Systems (SDIBS), a subsidiary formed after SDI's acquisition of Magna in May are working to strengthen the competitiveness of their European automotive battery business with a Low Pack battery designed for key customers including BMW and Audi . Daimler CEO Zetsche suggested an alliance to manufacture next-generation battery cells which is clearly a mission critical technology for the electric vehicle industry. The battle is currently focused on solid state battery development with Volkswagen, Bosch, Samsung and General Motors all having made recent investments. Perhaps, most noticeably, Daimler are not known to have any IP investments in this area.